Something Spooktacular is Brewing at Cameron’s for Cask Night! On Thursday, October 27th at 6:00 pm, Oakville-based Cameron’s Brewing Company will be hosting its annual Halloween-themed Cask Night. Visitors that night have the opportunity to sample a variety of one-off casks in honour of four years of Cask Nights at the brewery, including a Märzen, created by the brewmaster especially for that evening. With notes of sweet malt and a dry finish, there will be nothing scary about this brew! Additionally, attendees of Halloween Cask Night have the chance to take part in the annual Cameron’s Costume Contest, with prizes for both best individual costume and best group costume. Best group costume will win a Cameron’s Draft Party for themselves and friends, while best individual costume will win a Cameron’s Gift Basket including beer, t-shirts and beer glasses. 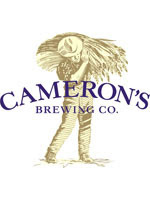 Cameron’s monthly Cask Nights offer visitors and longtime fans the opportunity to tour the Oakville brewery and learn more about their award winning ales & lagers, as well as sample a delicious variety of beer brewed on the spot. Admittance is just $20 and is often sold out, so arrive early – doors open at 6:00 pm. The brewery is located at 1165 Invicta Drive, just off of the North Service Road between 8th and 9th Line.